One of the most powerful ways of communicating with potential customers of your business is via a website, a website can be a very cost efficient form of advertising and a great source information for your clients about your services. Every website starts with the purchase of a domain name, a domain name is the address of your business on the web, e.g. 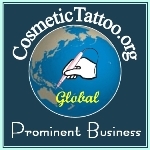 CosmeticTattooist.com has become an iconic web address attracting thousands of visitors from around the globe every week, our site generates numerous enquiries and new clients many of whom come from interstate and international destinations as well as hundreds of trade visitors. I believe that obtaining a good domain name is the best and most economical form of advertising that you can purchase. Q: Can I have more than one domain name? A: Yes, you may find that two or more domain names with associated web sites help to boost your marketing efforts, for example you could have a domain such as MakeupTattooist.com.au point towards your existing domain website to help capture traffic for the combined and individual search terms "Makeup" & "Tattooist". Q: So what is it that makes a website successful? Q: What is unique high quality content? A: Quite simply it means creating information on your website that describes who you are and what services you provide without copying other websites, copying the content on other sites may be penalised by search engines and result in low rankings and may also result in copyright infringement claims against you so make sure your content is unique (all your own work). Q: What makes a good domain name and extension? A: That will differ depending on your circumstances but as a general rule top level domains (TLD) or country second level domains (2LD) are regarded as the best and they are also the ones that fetch the best prices in the after market (resale). If you are doing business in, and only want to attract customers from, Australia then a .com.au is probably the best choice. If you are doing business in, or want to attract customers from, Australia and International locations then a .com and or a .com.au are worth considering. For New Zealand .co.nz and for the United Kingdom .co.uk. If there is a chance you may build an international brand then clusters of domains may be a good idea e.g. .com.au & .co.nz for a brand in Australia and New Zealand. For a Cosmetic Tattooist it is a good idea to have the word Tattoo/Tattooist/Tattooing or a variation thereof in your domain name associated with another descriptive word such as Cosmetic, Makeup, Eyebrows etc because those terms will have high keyword value for search engines and they are the most accurate terms for your services. Ideally you would have a name that is easy to remember, short as possible, clearly defines what your business does and does not contain dashes (-) underscores (_) and numbers (0,1,2,3 etc). If your business name succinctly describes your services and the web address for that name is also available then you are on a winner. How do your prices compare to the secondary marketplace for domains? You can compare our prices to the prices of one of the largest domain sellers by clicking here. Its worth remembering that in the aftermarket the .com domains can fetch considerable prices if they are premium names, in some cases domains have fetched millions. The name you can chose will of course be limited by availability and unfortunately most of the really good names are already taken, but we have a range of our own premium web addresses that were registered for our own use but are now surplus to our current needs and are available for very reasonable prices, all domain purchases include the cost of transfer into your name (which is charged by the domain registrar) and can cost up to $100, we absorb the domain transfer costs. NB. Restrictions apply to .com.au domain ownership so please check before purchasing click here for more information, please ensure that you provide us with accurate information for your domain registration as additional charges may occur for some changes, the details supplied in your CTshop account will be used for change of ownership unless you inform us otherwise at the time of ordering.